Past International Director Robert Gary Smith is a native Californian, born October 6, 1941, in Sacramento, California. After graduating from Courtland High School he worked for a short time with his father in the Smith Garage in Ryde, California. He also spent 3 years touring Europe courtesy of Uncle Sam including skiing the Alps and guarding the Berlin Wall. Bob joined the Sacramento County Sheriff's Department January 1, 1965. By 1970, he was the youngest sergeant on the force. He spent over 12 fun-filled years in patrol before becoming a detective in 1977. Bob spent 4 1/2 years in the narcotics division and combined 16 years in burglary and robbery with over 8 years undercover assignments. He also attended CSUS and Sierra Jr. College (where he also taught) during his early years with the department. Bob retired in March of 1997 after over 32 years of distinguished service. He met Vickie in 1973 and they were married January 9, 1977. They were blessed with their daughter Jennifer Maxine Smith on Mother’s Day (May 10) of 1981. The following year he joined Embarcadero Lions Club. After serving in all chairs (except treasurer) Bob served as Camilla Zone Chair and Sacramento Region Deputy District Governor. He was elected Vice District Governor in 1998 and served as District Governor 1999-2000 and Council Chair 2000-2001. Afterwards he went on to serve on membership and leadership committees for MD-4 California. Teaching and motivating is his passion! 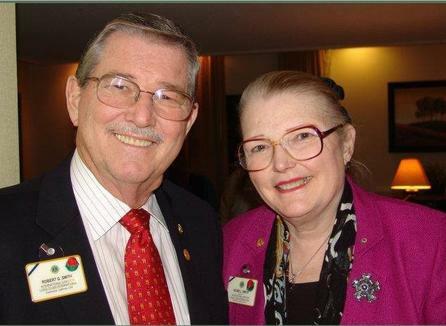 At the International Convention in 2010 - Sydney, Australia, Bob was elected to a 2-year term as an International Director for the association. He and Vickie were honored to visit 33 state and 6 countries during these 2 years - an amazing adventure to meet and share with Lions from all over. Some recognitions over the years: Club Lion of the Year 4 times, 4 District Governor Appreciation Awards, the MD-4 Excellence Award, 5 International President's Certificates of Appreciation, 5 International Presidential Medals and is a five-diamond progressive Melvin Jones Fellow. In 2007, Bob and Vickie received the Kay & Denise Fukushima Couple of the Year Award from MD-4 (which is proudly displayed in their home). Bob is also involved with the Fraternal Order of Police in Sacramento County and has served in the California Peace Officers Association & California Narcotic Peace Officers Association. During his career he received 3 Unit Citations from the Sacramento County Sheriff's Department, and has oh so many stories to tell!!! Vickie and Jenn are also Lions in Embarcadero Lions Club - a family affair. Bob's slogan as District Governor was "Commitment to the Community" and his motto as International Director was "Integrity a Way of Life" - both describe how he has lived his life.